A Local search Google patent granted this week targets map spammers, who submit information about businesses to Google Maps, in a manner referred to as keyword stuffing. The patent attempts to find words submitted by business owners as titles for businesses names that trigger a surprisingness value for combinations of words within a business title to determine whether a business listing is legitimate or fraudulent. Traditionally, in Google Maps, the ranking signals used by business listings to include those businesses in search results depend upon their distance from a searcher, how prominent a business might be on the web, and how relevant the title for a business might be to the query used in a search to find the business. For example, a third party hijacker (or a hijack spammer) is a third party that tries to get a particular business identified or associated with another highly prominent business such that the particular business’s listing or information is displayed prominently in a list of search result. We’re told that important businesses may be targeted, like well-known restaurants or hotels, and information about them such as their contact information, like a phone number, may be submitted into listing data associated with the particular business. This patent looks for when a hijacker attempts to insert that prominent business’s title (name) into the title or content of a submitted business’ listing, to engage in creating a fraudulent or “keyword-stuffed” listing. The patent provides an example of someone trying to do this. A keyword-stuffed business listing shows up on a search for “courtyard 4422 y st marriott sacramento” into Google map search. 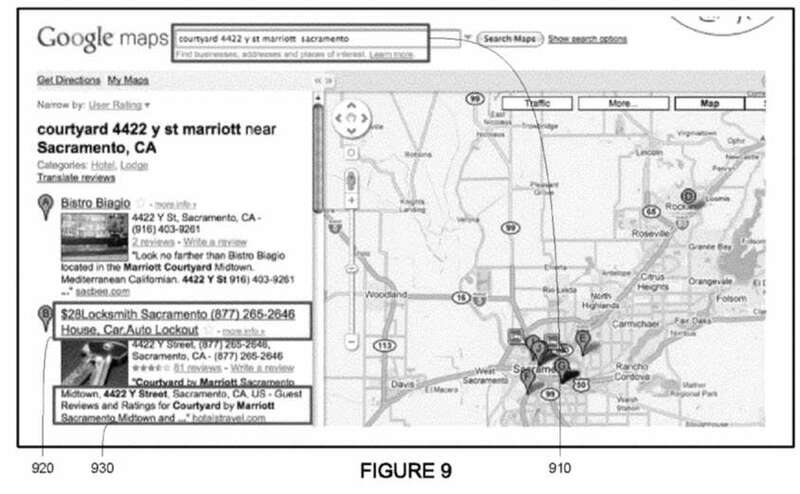 The patent tells us that since this search was for a hotel, the business listing would be considered unrelated. But, it shows up in that search because it has references, such as user reviews, to the name and address of a Courtyard by Marriott. The business listed in that search may not be a legitimate business. The patent tells us about a machine learning classifier approach, that could learn differences between spam and non-spam, by looking at combinations of words in large collection of business titles. If a business name is submitted that triggers a surprisingness value above a certain threshold based upon the words within that title, it might be considered spam. The present invention relates generally to identifying fraudulent businesses and business listings. More specifically, the invention relates to determining a “surprisingness” value for a particular combination of words in a business title based on the likelihood that the combination has appeared in legitimate business titles. The value may be used to determine whether the business or business listing is legitimate or fraudulent. For example, third party hijackers may “keyword-stuff” business titles or attempt to include words associated with prominent businesses in a title of a less prominent business associated with the third party in order to have the less prominent business displayed more often in search results for the prominent business. For example, if a business title has too many surprising word combinations or a particular combination is highly unlikely, the business listing is likely to be fraudulent or “keyword-stuffed” and may be withheld, excluded, removed from search results. So a business title that includes the words “Locksmith Restaurant” would have a higher surprisingness value than one that contains the words “burger restaurant.” If that surprisingness value was above a certain threshold, the business listing with that phrase in its title might not be displayed as a search result. One of the inventors listed on this patent was also listed on two more patents I wrote about earlier this year involving Google Maps and fighting MapSpam (the team at Google that tries to stop the spamming of Google Maps appears to be known as the Mapspam team according to LinkedIn Profiles for some of the people doing that). The blog post I wrote about involving that earlier patent was Google Maps Using Photos to Identify Spam? Both of those patents involved using photos of business submitted to Google Maps to determine if they were real businesses; one involved looking at Street Views pictures of the businesses, and the other asked business owners to sent photos of their businesses to help verify their existence. In both instances, it seemed like the MapSpam team wanted to look at photos that listed the addresses of the businesses submitted. Automating a way to look at how “surprising” the titles of business names may be seems like a good way to flag businesses that might seem suspicious. As this patent says, looking for “too many surprising word combinations or a particular combination is highly unlikely” do sound like good ideas when trying to notice people submitting fake business information. Thanks a lot for writing this topic sir. I hope google resolve this issue, I saw a lot of companies taking advantage this G Map in search engine. I also hope Google add more category so that it will be easy to place your business on the map. It really could make a difference. I’ve seen more Mapspam fighting patents so far this year than I have over the past few years, and they’ve made me optimistic that Google may have some control over the problems they’ve experienced in the past. Fingers crossed. You’re welcome. I’d like to see stuff like they described as a problem gotten rid of from Google Maps. More categories would be a good thing, too. I guess we wait on that one. This kind of fits in with a few things in the past when Matt Cutts and John Mueller have referred to things that “look as though they should be there” (i.e. natural), not being a problem. e.g. Does something look like it should be in this location in a title, page, internal link, etc. etc. Surprisingness value would fit very well with that. Surprisingness does seem like a matter of identifying things that seem to be out of place. I watched an interesting talk by Tom Anthony @TomAnthonySEO entitled ‘How To Spot A Bear – An Introduction to Machine Learning For SEOs” last year which essentially covered collections of words / links / etc which ‘fitted together’. If something didn’t fit it triggered a false essentially in the machine learning pattern. This ‘surprisingness’ element would fit very well with that for sure. They’re only going to get better at this going forward as the learning continues. I am wondering what DeepMind, the AI company Google acquired last year, might bring to search indexing. I suspect we’ll see some interesting things along similar lines. I suspect that Google will only get better at this, too. Yes, some of the patents that are coming out from Google have more levels of complexity to them than they had in the past; which makes things interesting; we’ll see where that goes. Google maps really helps finding locations easy way but it need some upgrades.I hope google will update it shortly. That’s good since there are a lot who are taking advantage using the brand + keyword + location strategy. But I am a little unsure of their algorithm because there are other reputable companies with good and legit reviews but are not ranking well on the top 3 result. What is Google’s basis so that they can rank on the top local results? I hope you can give an insight or advice about this. Thanks! This is the first time am reading about this gonna research on it and get work on it, thanks alot and this is very informative. Finally, I have never understood why they didn’t take care of this in the first place. Example would be when someone doesn’t use their brand name as their title and they use an exact match keyword. I hope this is fixed as well, because Google is suppose to be on top of these unethical tactics, but it seems that they aren’t. I see this day in and day out and it’s very annoying. I hope this rolls out across the Atlantic as well. I have seen some of our competitors locally apply this trick. I also was surprised at the image the google streetview as it showed the wrong street even compared to the satellite view. So our credibility would have been harmed when trying to get into local search. That was quite informative, btw i am still concerned some facts like latest SEO updates creating a choas among the SEO experts and all that. Exact match keywords should be an immediate red flag or anything that includes a hyphenated modifier on the end. I think it’s a great idea. I’ve seen so many people try to take advantage of the map listings by using these SEO techniques. I personally have never done that because I knew Google would crack down on it sooner or later. Whether or not this will roll out in Melbourne, Australia at the same time is another thing. I think Australia is a completely different algorithm and there’s a lot of people getting away with shady SEO techniques. I completely agree. I had a plumbing client that had 3 plumbing companies that were dominating the local map pack and I wasn’t even able to get them into it due to these fraudulent business listings. It would be good to get rid of fraudulent listings like those. Google…. Appliance Repair Dallas TX isn’t a business name, it’s an exact match keyword stuffed in a Business Name Field. And I don’t care how they spell it, Lone Star Appliance Repair & Lonestar Appliance Repair are the same company, with 1 location — not three. How is it you’re still allowing PO Boxes to be used for verification?!?!? Frustrating lack of action on Google’s part. Regardless of whether or not you believe Google is fighting spam; we know that too much spam would be harmful to local search results. Hopefully the mapspam team at Google will become more effective than they have been. We can hope. Very useful post! I am trying to learn much more about Google My Business (GMB), which helps businesses get their locations claimed in Google Maps. So when I saw your post, I immediately started to link it with GMB and how it works in New Zealand – Where I live. I did a post using some of your expert knowledge contained in this post and my experience in NZ with GMB. I was also thinking maybe Google will start asking for some form of business name verification documents from the businesses as Google My Business evolves. Considering that the competition for GMB and being in Local Snack Pack or being in front on Google Maps will increase, Google might need to have another verification process. Could you be a business name verification process or something like a code that you upload in GMB or on the website. Maybe what they won’t need any of such process in future but it would be interesting to see how it will be when it has become more sophisticated. I think there’s a very real possibility that Google may use business verification documentation to improve the quality of submissions to Google My Business. I have seen, but not written about a Google patent that involved Google checking with Zoning laws in different jurisdictions that might help them verify businesses. A couple of concerns about Google relying upon business documentation requirements: (1) Will requiring such documentation slow down the process of listing businesses that should be listed, and (2) is there an easier way for Google to get access to this kind of information about businesses than requiring business owners submit it to them? I agree with the concerns mentioned by you and feel that the businesses will feel annoyed by the whole process of doing it.